Just mostly finished up my conversion. 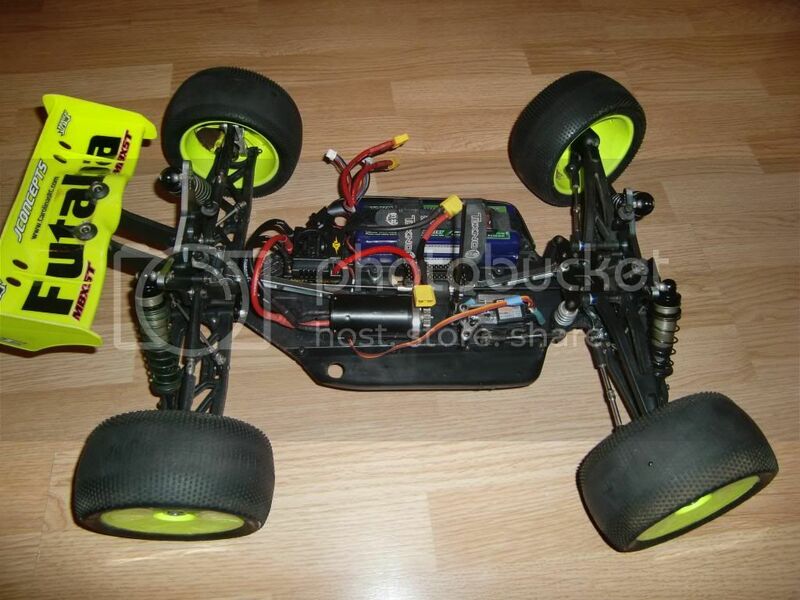 Got this used as a roller from Krawlin with a buncha parts for a good deal as he is getting out of RC. I tore the thing all the way down and cleaned off every piece with soap/water or WD40 depending on the material. It came with the tekno battery tray so I stuck that on there. Ordered me an RCM motor mount with servo top plate (had enough stock servo plates to just cut one up but the rcm one was only an extra $5!). 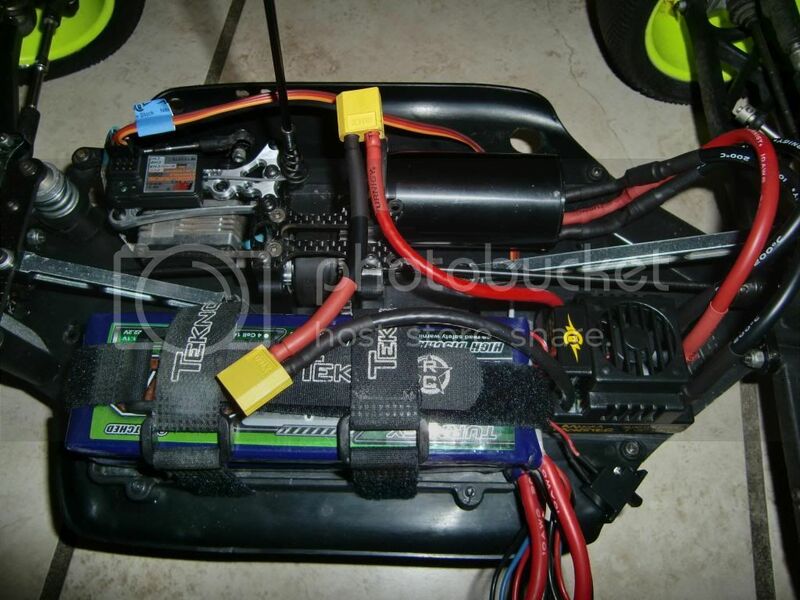 I'm using a NEU 1515 2Y motor (1100Kv). I'll be using both 4S and 6S. I didn't do a great job mounting the battery tray. drilled the holes in the spots I wanted no problem, and then I dremeled down some material from below the tray to let the nuts holding the rock guards go in a little to get the battery lower. 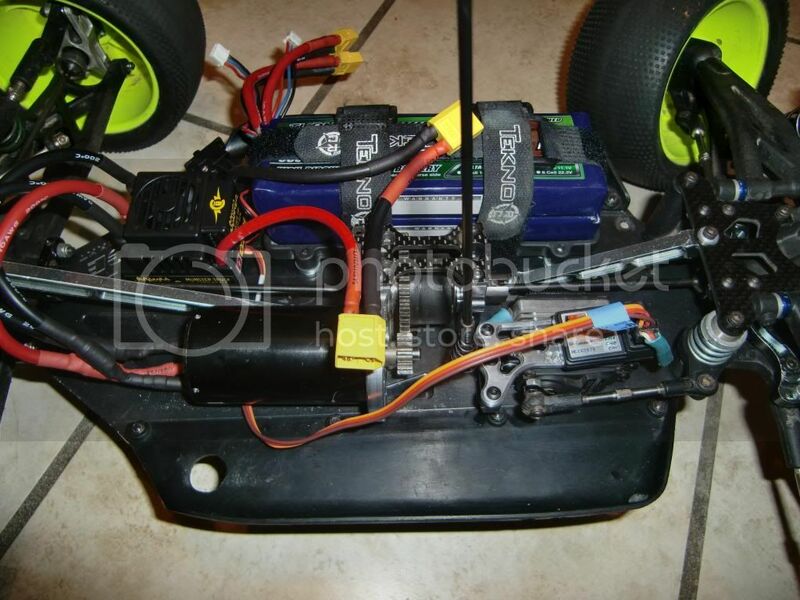 I added washers under the tray to keep it about level all around since the rock guards are higher than the chassis. Where I miffed was the countersinking on the holes on the chassis. I thought I had the right bit, but didn't, so I punched through on one, and ended up using a larger drill bit on the 2nd to countersink. They both don't sit totally flush. I'll probably go back and fix them up later with the right bit. Also, on my first run I thought it sounded a little funny. Pretty high pitched squealing on heavy throttle and braking. 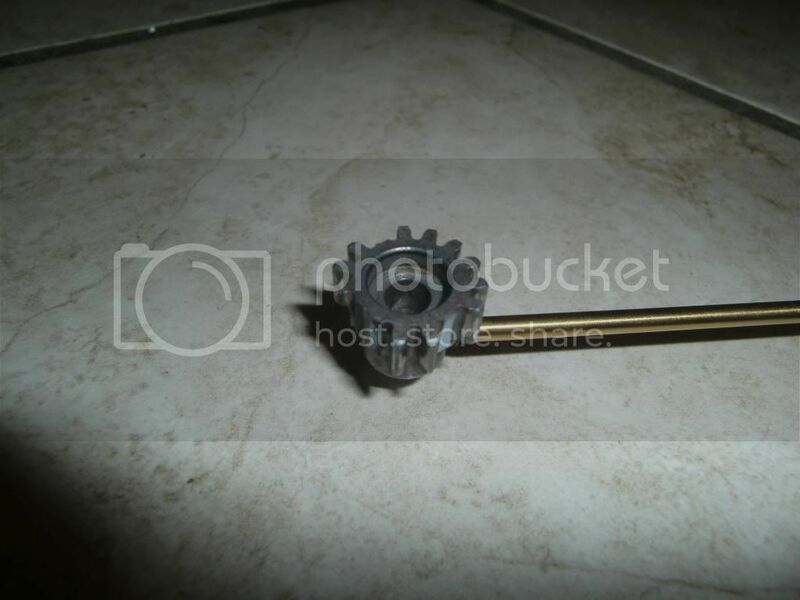 Figured it was just the steel spur with the pinion being loud like on my savage flux. This thing is fast on 4S with a 15T pinion, 6S must be silly fast. Running the bald tires are street tires. It's currently about 4 degrees outside so I didn't test long. I also shredded the pinion in about 4 mins. Pretty sure my mesh was dead on. Maybe the pinion is old as sin or I'm an idiot. Time will tell with the next one. Got the pinions with the truggy. Center diff gear looks fine though, so that's good. need to find the castle link and add some punch control and maybe torque limit. Wasn't cogging too bad. Center diff was the hottest thing after the run at 105F in 4 mins in 4F weather, might have to do something about that if it doesn't cool off with punch control. don't want to melt anything. figured out why it felt so fast on 4S. I accidentally put in the 1Y, not the 2Y. Guess it would help if I knew how to read before I put a motor into my trucks. Sigh, have to bust out the soldering iron again. Will leave this for a later date I think, run the 1Y for now on 4S. At least until it warms up a little, then I'll try the 2Y. Thanks to the castle link KV output to telling me I'm an idiot, haha. Pretty good lookin' truck there, I dig the Mugen's. Thanks guys. It's my first 1/8th Truggy. I have a CRT.5 but bigger is always better, haha! Can't to get it to some good bashing with some fun jumps! Just looking at that steering angle is enough for me to retire the LSP-2. I don't race much, but the old Hot Bodies' does not turn on a dime. When my latest project is done, I think I'm going to build a new truggy. Yeah I'm surprised at how far the tires are thrown for steering. But I guess I'm used to the savage. 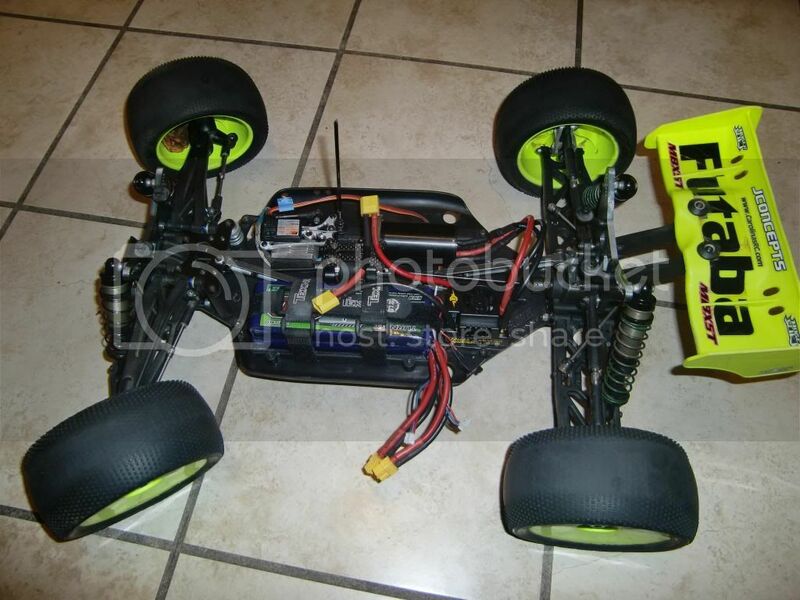 This truggy is actually pretty old, came out in 07 I think. It's kind of strange for me seeing pictures of my Mugen knowing it's with a new owner over 2000 miles away and an electric conversion in it rather than my ol' reliable Werks B5 .21. 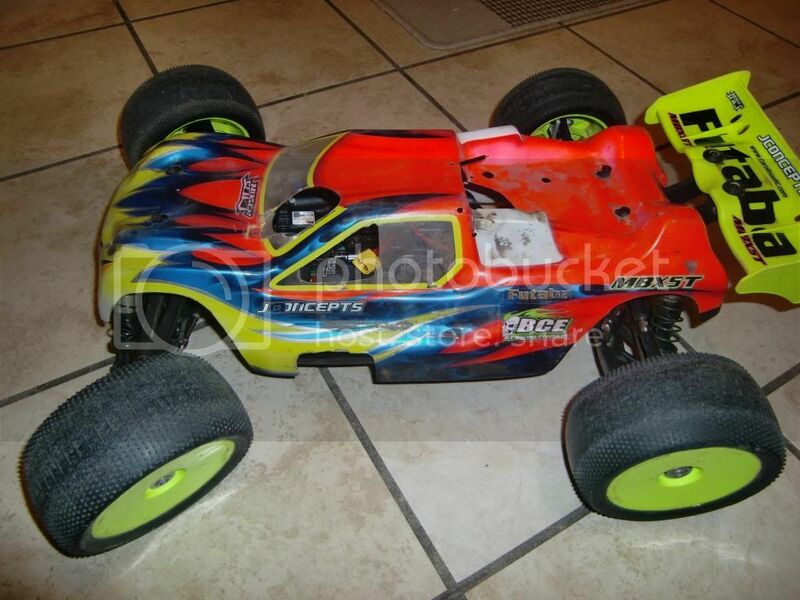 I miss it already, that was my all time favorite RC, had it for almost 4 years, and it's had quite the racing pedigree when it was with the previous owner in Florida and lots of good times on the track in Arizona. It looks great as Mugens always do. Take good care of her for me will ya? Just to keep the history of this truck alive, here is a video of it racing in Florida with original owner (the guy I bought it from). It has the same body on it in the video that is has in the pictures that Brainanator posted. Proud Member & Online Recruiter for Team Terribles! Last edited by Krawlin; 11.30.2012 at 09:22 PM. That's quite the testament to Mugen, it being on the 3rd owner, having been raced hard and it's still going strong. 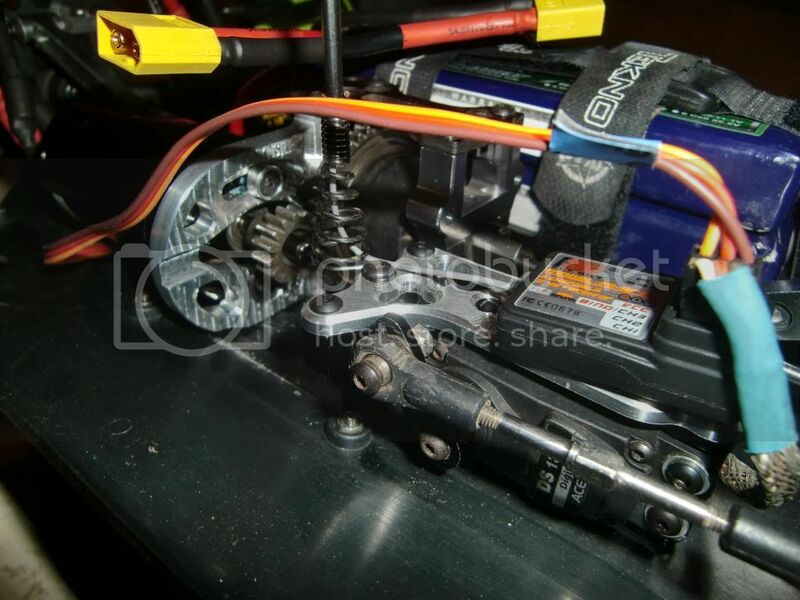 Krawlin- what kind of brushless motor is a werks b5 .21? Oh yeah, the Rx box came in. It's a little bigger than I thought it would be (...) but it still fits fine on the servo. Though it is a bit of a pain now to remove the servo since I didn't plan it out very well. Have to open the Rx box to get to the screw to remove the Rx box. Then you can get to the servo tray. But I don't plan on messing with the servo much (crossin fingers). Drove up and down the street again and this pinion is holding up fine. Also found a busted thing in the front CVD. I think I tightened the set screw too tight when I rebuilt them. Last edited by brainanator; 11.30.2012 at 10:27 PM. Semi-pro on the racing there, look's like that thing has had a hard life. I recognized the body from the earlier posts, and it seems like they knew what they were doing. Anytime you see a straight T-Bone in the racing arena, makes me feel at home.